Tag: What did birds and insects do during the 2017 solar eclipse? In August of 2017, millions peered through protective eyewear at the solar eclipse — the first total eclipse visible in the continental United States in nearly 40 years. During the event, researchers from the Cornell Lab of Ornithology and the University of Oxford watched radar to observe the behavior of birds and insects. Their findings have just been published in Biology Letters. Using data from 143 weather radar sites in the continental U.S. — 8 of which covered areas of eclipse totality — researchers were able to “see” the behavior of wildlife during the eclipse, which produced conditions similar to sunset. Nilsson and her team looked at wildlife behavior in the air on radar two days before and after the eclipse and compared this activity with the behavior observed during the eclipse. They found that although typical daytime activity in the air decreased — behavior such as foraging for food — typical nighttime activity did not increase — behavior such as high-flying migration. At the eight sites that were within the path of totality, where there was complete darkness for a few minutes, something interesting occurred. “At some of these sites we saw a sudden burst of activity during the moments of totality. This could be insects or birds flushing into the air as a reaction to the sudden darkness,” says Nilsson. The next solar eclipse over the continental U.S. is in the spring — April 8, 2024 — and Nilsson is looking forward to inspecting eclipse behavior among birds and insects once again. 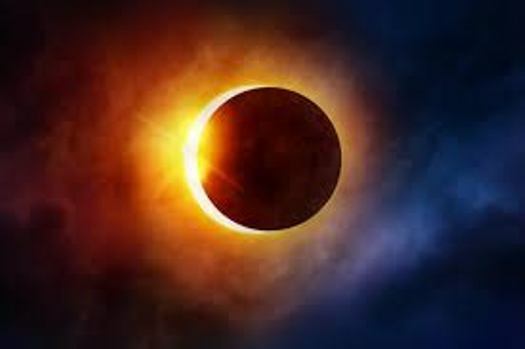 Author Mitch BattrosPosted on November 23, 2018 Categories Breaking News, Sun-Earth ConnectionTags What did birds and insects do during the 2017 solar eclipse?